Only one pair of boots—and the cowboy wearing them—can get Annie out of the mess she’s in. Annie Wilkerson is Moose Creek’s premiere horse trainer and equine columnist for Montana Living. Money is tight as she tries to put her kid-sister through college and provide for her young nephew. When Annie’s column is cancelled, she’s given first shot at a new lovelorn column—and she can’t afford to turn it down. Only problem is . . . Annie’s never been in love. Always resourceful, she reluctantly strikes a deal with the town’s smooth-talking ladies’ man Dylan Taylor: She’ll work with his ailing horse, Braveheart, if he’ll help her answer the reader letters. Working closely with Dylan is harder than Annie imagined, and she quickly realizes she may have misjudged him. But her unwavering conviction that cowboys are nothing but trouble has kept her heart safe for years. And she can’t risk getting hurt now. The more Annie tries to control things, the more they fall apart. Her feelings are spinning out of control, and her sister’s antics are making life increasingly more difficult. Annie knows she needs to turn the reins over to God, but surrender has never come easily. When Dylan reveals his feelings for her, Annie doesn’t know what to trust—her head or her heart. The trouble with this cowboy is that he might just be exactly what she needs. 'The Trouble with Cowboys' written by well known romanticist Denis Hunter and part of the 'Big Sky Romance' series will provide readers with just the sort of entertainment they might look for on a Autumnal afternoon! There is no doubt Denise Hunter gives her audience what she promised: an enjoyable alternative to the humdrum of everyday life. I had the opportunity to read another of her novels (on a long layover in a faraway airport with little amenities!) called 'The Convenient Groom' and I will tell you she had me in stitches! Be sure to check her other titles! But back to The Trouble With Cowboys! This Christian author has a knack for the light but never fluffy sort of novel that you will gladly reach for along with a good mug of cocoa! Entertaining yet with a lesson or two (don't miss each chapter header! ), a message tucked here and there and perfect to share with anyone including the younger generation! Denise Hunter's books are wholesome and will win your heart! Montana born and raised Annie Wilkerson is an expert horse trainer, a loving sister and a great aunty. Life has dealt her a lot of responsibilities since her GrandPa died. Taking care of her wayward sister is not easy and she takes on her role of Mum seriously hoping to see her sister settle. Annie does not trust cowboys: they are here today, gone tomorrow. The past has taught her to stay clear away from them. Easy going Dylan needs her help with his nearly blind horse and in turn, Annie could use his help with her latest assignment, a lovelorn column she feels is just not for her since she has never felt love before. So they make a deal: her equine expertise for his help with her column. Annie is struggling with financial responsibilities but promised her GrandPa she will take care of everyone and she is trying to ignore her qualms. She cannot trust Dylan because he is a cowboy after all and will probably break her heart. Then again, is she judging him too quickly? Or should she let her heart and faith guide her? I think we shall agree once you read this story: if Denise keeps on writing, we'll keep on reading! 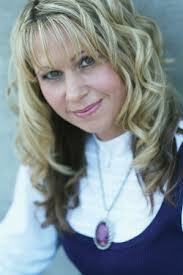 Denise Hunter is the nationally published author of bestsellers Sweetwater Gap and Surrender Bay. She has won The Holt Medallion Award, The Reader's Choice Award, The Foreword Book of the Year Award, and was a RITA finalist. In 1996, inspired by the death of her grandfather, Denise began her first book, writing while her children napped. Two years later it was published, and she's been writing ever since. Her husband says he inspires all her romantic stories, but Denise insists a good imagination helps too! For more on this author including reading the first chapter of this novel see website (here). Love the banner! And be sure to sign for her newsletter! Denise Hunter’s “The Trouble with Cowboys” Facebook Party & Kindle Fire Giveaway! 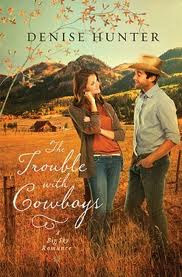 To celebrate the release of The Trouble with Cowboys Denise is hosting a fun Author Chat Party on Facebook. She'll connect with readers and give away some amazing prizes - including a Kindle Fire! Save the Date for October 11th! During the evening she’ll be sharing the story behind the book, posting discussion questions, testing your trivia skills, and of course, there will be plenty of chatting and fun giveaways – books, gift certificates and – a Kindle Fire! She’ll also be giving you a sneak peek of her next book too! RSVP today and then come back on the 11th … and bring your friends! I received this book free from LITFUSE as part of their blogger review program. I am disclosing this in accordance with the FTC 16 CFR, Part 255 'Guides concerning the use of endorsements and testimonials in advertising. I was not asked to write a positive review and all opinions expressed are entirely my own. Keeping Everyone In Thoughts & Prayers!